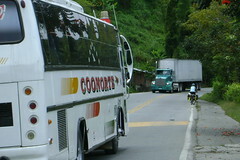 We've heard many people complain about motorists in Latin America, we we haven't had a lot of trouble. We actually have quite a lot of respect for the drivers, especially the professional drivers, as they seem to know what to do with us and often do it with courtesy. However: The more you stay on the busy roads, the more complaints you will have. For example, we often say that there are two experiences cyclists have in Mexico. Those who come down the main highway on the west coast feel like Mexico is one big, busy, ugly highway. Those who mosey down the small roads in the interior of the country feel like it's a wonderful, welcoming, interesting country with reasonable highways. We think Latin American drivers are far more skilled than those in North America, since they're used to avoiding all manner of obstacles in the road - not just bicyclists, but also donkeys, dead horses, kids, and the like. They're far more defensive and ready to avoid an obstacle. In many countries, there is a specific routine of honking the horn to let cyclists or pedestrians (or anyone else) know that a vehicle is coming from behind. Often this is a quick tap of the horn, but it may be more. It is generally not meant to be offensive, but rather to let you know they're coming. In Guatemala the buses have enormous air-horns, and are honking them all the time, but it's not necessarily to tell you to get out of the way - they're letting people know that the bus is coming and they'll want to get on. However, I don't want to be in the way of any of those Guatemalan buses! There is a myth among US cyclists that the bicyclist needs to just take his lane and make the motorist pass. Our opinion is that this just doesn't work in most places, and especially where a motorist may approach suddenly - they won't have enough time to avoid you and you'll be dead. The roads in Latin America are shared, and getting along on them is a matter of cooperation. We get out of the way for the trucks and buses, and they give us a little room. It's all about cooperation. If you are riding on a busy, fast road, remember that visibility is crucial. If a motorist has just a fraction of a second more notice that you're there, an accident is that much less likely. When we rode several hundred miles on highway 15, a straight, fast toll road in Sonora with no shoulder, we wore "screaming yellow" vests and could tell the difference. Motorists had just a little more time to move over and get ready to miss us. Nancy wrote about riding safety here - one of the key things she said was that when riding together, the partner with the higher tolerance for traffic should ride in back. That way the cars start to get out of the way earlier, and the more-tolerant partner can handle it. All that said, the busier the road, the more it all breaks down. If there's too much traffic in too little road, it will just be a nasty experience. That's yet another reason to study the roads ahead, have good maps, and avoid the big roads.